It's so hard to go back to work after the holidays. 'Di ba? I've been running an audit program at work, and it seems that I'm auditing too many records every batch job, so right now, I've only audited 8,000 out of the 210,000+ records. Yeah, good luck to me. I hope I finish this audit thing before the month ends. I got pissed off at him this week. [Kelan ba hindi?] I just feel guilty I get pissed off because of that. Then I get mad at myself for being guilty! Haaay. Rollercoaster of emotions. Always because of him. Last Thursday, I made cheese pizza for Darice's breakfast. 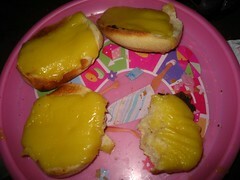 I sliced some QuickMelt cheese, put them over some sliced bread, and toasted them for around 3-4 minutes. To say that Darice liked them would be an understatement. She's been requesting for cheese pizza for breakfast since that day. 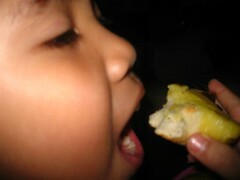 Here's the pandesal version of her cheese pizza today. And there she is enjoying every bite.